With this post, I want to introduce the new ‘propagate’ package on CRAN. It has one single purpose: propagation of uncertainties (“error propagation”). There is already one package on CRAN available for this task, named ‘metRology’ (http://cran.r-project.org/web/packages/metRology/index.html). but uses a second-order polynomial to account for nonlinearities, making heavy use of numerical or symbolical Hessian matrices. Interestingly, the second-order approximation gives results quite similar to the MC simulations! * plot.propagate: Graphing error propagation with the histograms of the MC simulations and MC/Taylor-based confidence intervals. * predictNLS: The propagate function is used to calculate the propagated error to the fitted values of a nonlinear model of type nls or nlsLM. 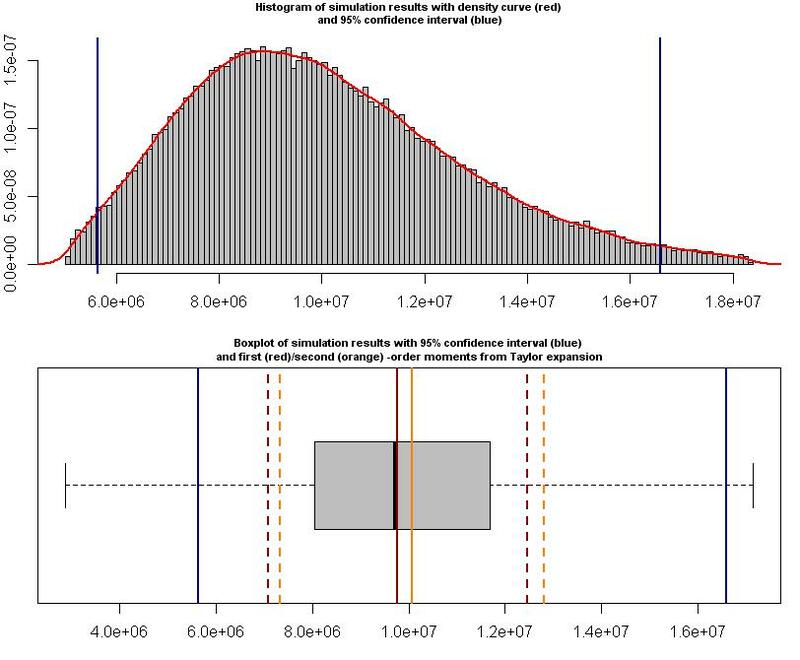 Please refer to my post here: http://rmazing.wordpress.com/2013/08/26/predictnls-part-2-taylor-approximation-confidence-intervals-for-nls-models/. * makeGrad, makeHess, numGrad, numHess are functions to create symbolical or numerical gradient and Hessian matrices from an expression containing first/second-order partial derivatives. These can then be evaluated in an environment with evalDerivs. * fitDistr: This function fits 21 different continuous distributions by (weighted) NLS to the histogram or kernel density of the Monte Carlo simulation results as obtained by propagate or any other vector containing large-scale observations. Finally, the fits are sorted by ascending AIC. Skewed-normal distribution, Generalized normal distributionm, Scaled and shifted t-distribution, Gumbel distribution, Johnson SU distribution, Johnson SB distribution, 3P Weibull distribution, 4P Beta distribution, Triangular distribution, Trapezoidal distribution, Curvilinear Trapezoidal distribution, Generalized trapezoidal distribution, Laplacian distribution, Arcsine distribution, von Mises distribution. Most of them sample from the inverse cumulative distribution function, but 11, 12 and 15 use a vectorized version of “Rejection Sampling” giving roughly 100000 random numbers/s. Have fun with the package. Comments welcome! To leave a comment for the author, please follow the link and comment on their blog: Rmazing.